With the Eat & Drink Festival soon approaching, we've rounded up 10 reasons to visit the show this year. If this doesn't tempt your tastebuds then nothing will! Tony Singh MBE has partnered with Love Food Hate Waste to show you how to limit waste and save money. TV chef Rosemary Shrager will also take to the stage, along with STV's Jimmy Lee and Master Chef The Professionals quarter finalist Mark Heirs. Watch chefs cooking live at the Eat & Drink Stage. Discover new dishes and hear inspiring career stories. Drinks industry experts will give their insider knowledge on choosing drinks and pairing them with food, as well as cocktail crafting tips and free tasters of a range of beers, wines and spirits. 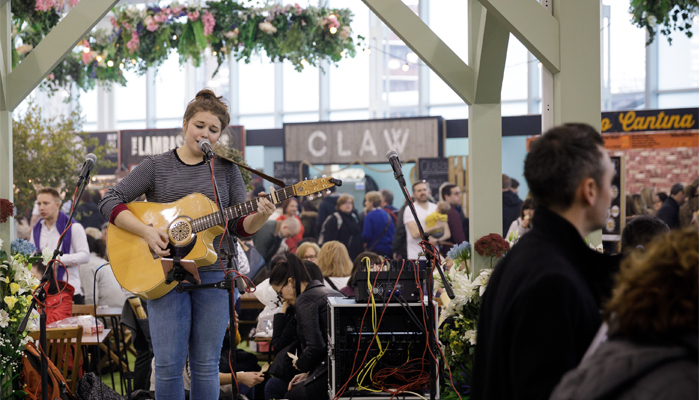 Soak up the atmosphere with live music from buskers on the bandstand, sizzling streetfood in the Great Eat from cuisines across the globe cooked fresh before your eyes. Plus, you'll find independent brands selling ingredients, preserves, baked treats and more in the The Artisan Producers Market. We'll have the most instagrammable food and drink on offer, from Honestfolk Gin Bar's 5 killer cocktails, including gin slushies, to giant crepes with every filling from Vive La Crepe! Plus the best industry experts' live demonstrations. If that's not insta-worthy, we don't know what is! Enter a world of inspiration for your home with 100s of homeware and innovative product exhibitors. Experts such as Phil Spencer will give talks on the Super Theatre stage. Plus, get free one on one advice from professionals at the Renovation Advice Hub. Streetfood vendors with trailers just as stylish as their food is delicious! Watch out for Khushi's Jingle Bus in particular, which is decorated in the colourful Pakistan tradition! From Flint and Flame's knife range (used by Monica Galetti), to the handy Stretchy Lids that fit to a range of foods to keep them fresh and reduce waste. Get all summery at Eat & Drink Festival without the sunburn! Enjoy an ice cold tipple of your choice or one of Bon Accord's refreshing soft drinks, and treat yourself to one of Equi's Scottish tablet flavour ice creams to cool down! Getting the BBQ lit, waiting for it to heat up, not knowing when the meat is ready... who needs the stress! At the show you can get sizzling BBQ style food cooked for you in an instant! Love Food Hate Waste Scotland will be sharing their ingenius ways to stop throwing so much food away, use up leftovers in new recipes and save money in the process!